Drumochter 5 - 0 !! Setting off at 4.50, I'd decided to do the Drumochter 4 which looked straightforward and not so exciting that Allison would mind. 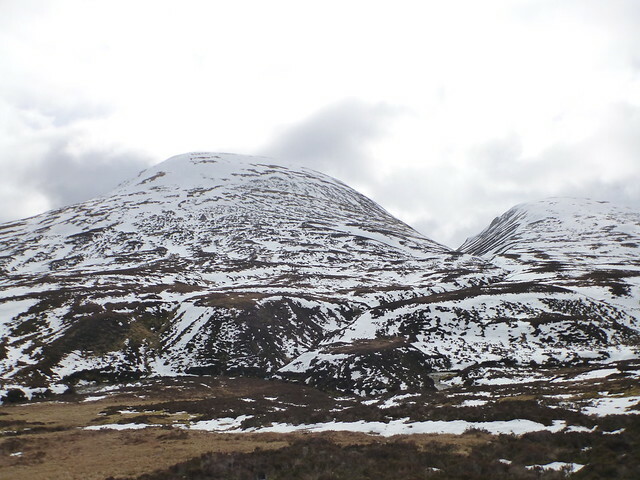 And thought I'd put the Sow of Atholl in at the end for a little bit of challenge. The weather was looking less good than it has for the last fortnight. 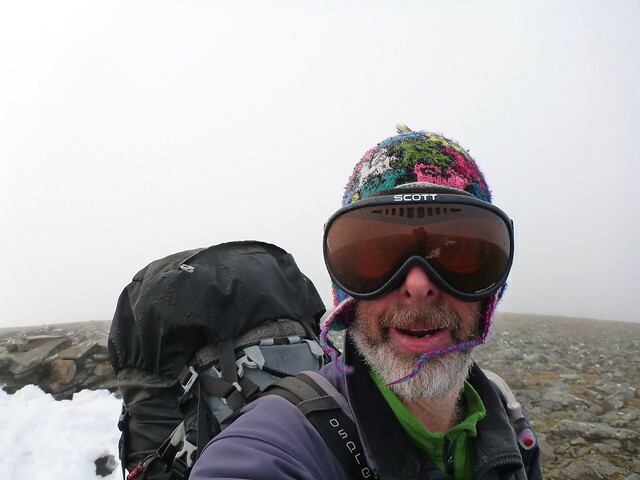 Like you, I was getting really sick and tired of endless days of sunshine and clear skies making hillwalking just the most rewarding activity imaginable - what we needed was a return to the *proper* conditions of the Scottish Hills - yep - CLAG. Bring it on, we love it. Got up to Balsporran cottages for about 7.15 and set off - one other car arrived while I was there with 2 guys who overtook me just after the summit of the second hill. Anyway, across the railway at the crossing and up the path which was a little soggier than would have been ideal - the car had said the air temp was 6 degrees, so I guess some melting was inevitable. Certainly none of the hard frozen over snow that did for the dog's paws last week - he wasn't quite recovered enough to make it today. 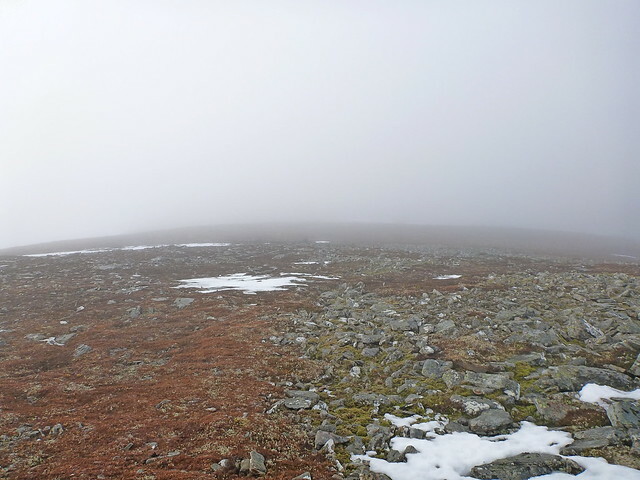 The rise to Geal Charn was fairly easy, but quickly into the clag. 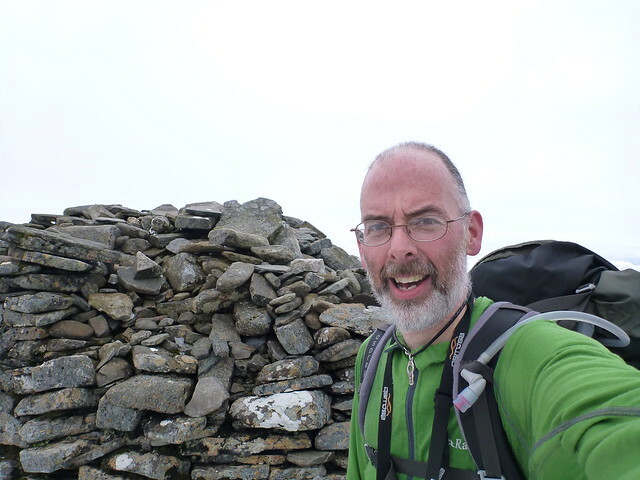 Passed the ruined "standing men" cairns and made the summit in about 75 minutes. 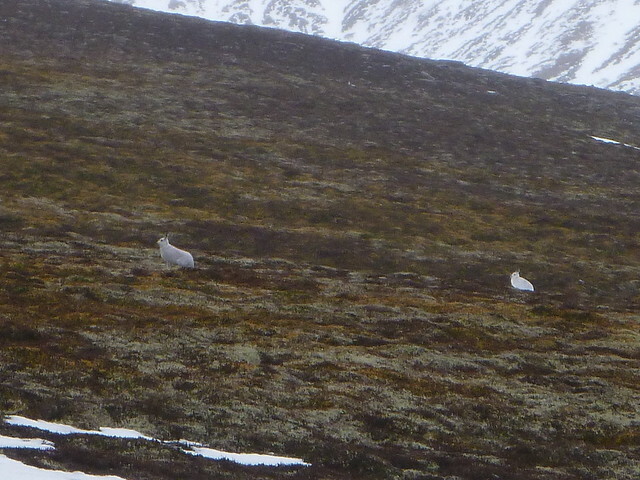 Several leggy winter hares bounded away over the snow patches, looking like spring lambs from the distance. Quicker lambs than your usual sort, I'll grant you. 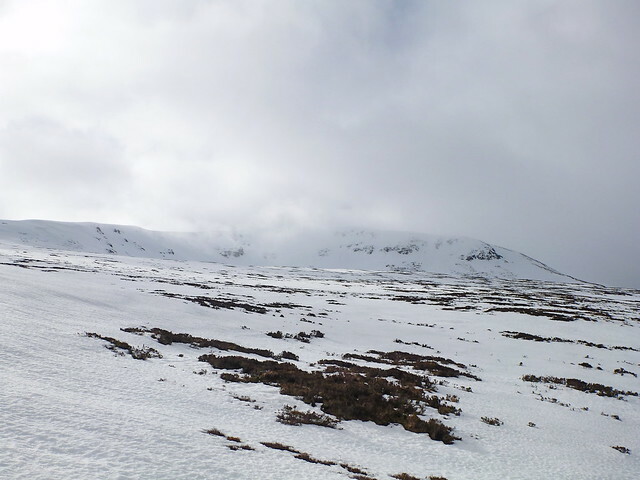 Other wildlife includes numerous black grouse and even some flies grounded in the snow along the hilltops - where do bleedin flies come from in early March?? 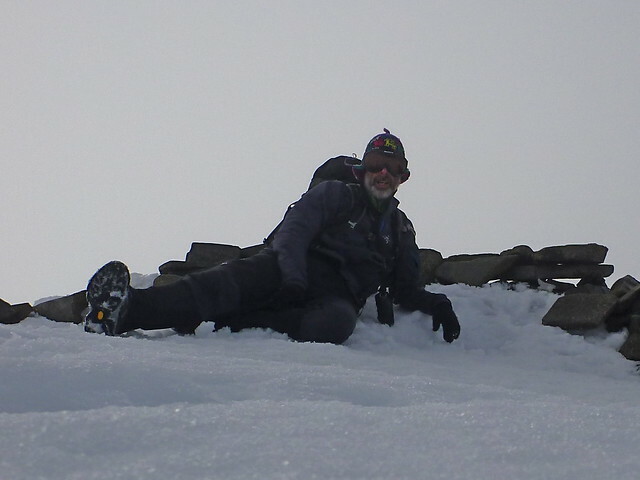 Was nippy at the top so didn't hang about and pressed on to the second top of the day, A'Mharconaich. It's initially quite rocky. 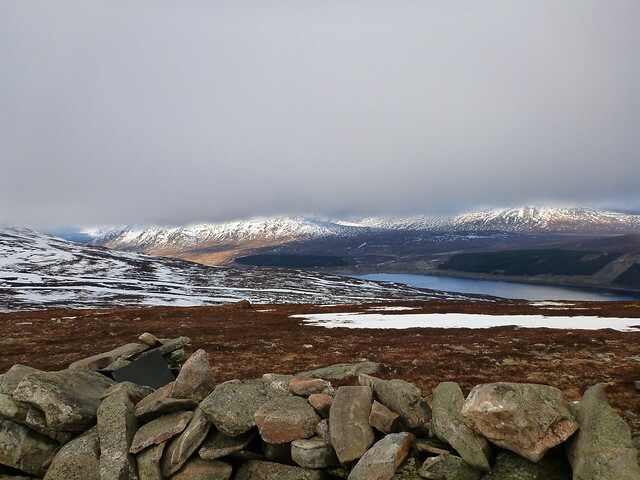 On the way over the bealach the sky opened up over to the West and I got a tanlalising sight of Loch Ericht and the fabled kingdom of Ben Alder - scheduled for exploration at Easter Time. I had jhoped to get a good look along here, but this one sighting was about as much as I got all day. The top of what I took to be Alder was sliced off by cloud. View was pretty close to zero and the chill factor had worsened so that after a brief peer about in the fug my hands were cold and i was chittering a little. 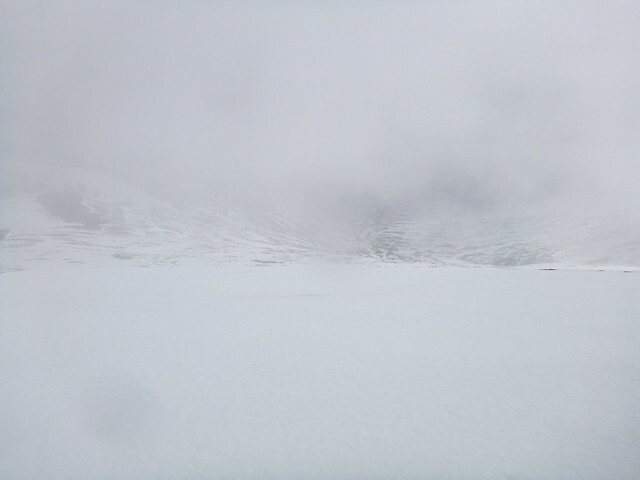 I knew there was meant to be a corrie to look down into from the second cairn, but it was all whiteness today. 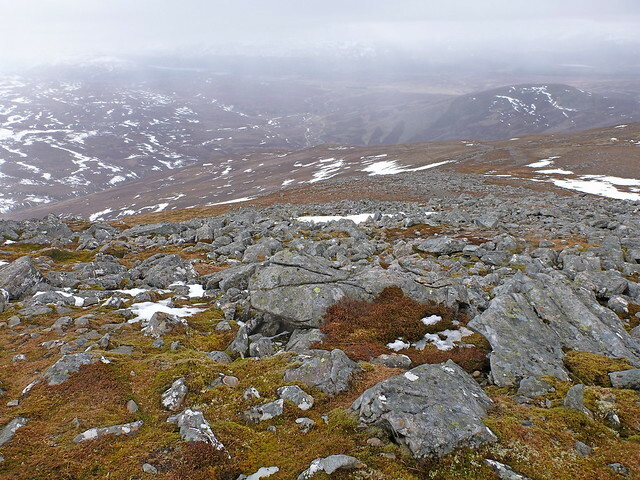 Next, and for my 50, was the "Gloomy Hill" , Beinn Udlamain. 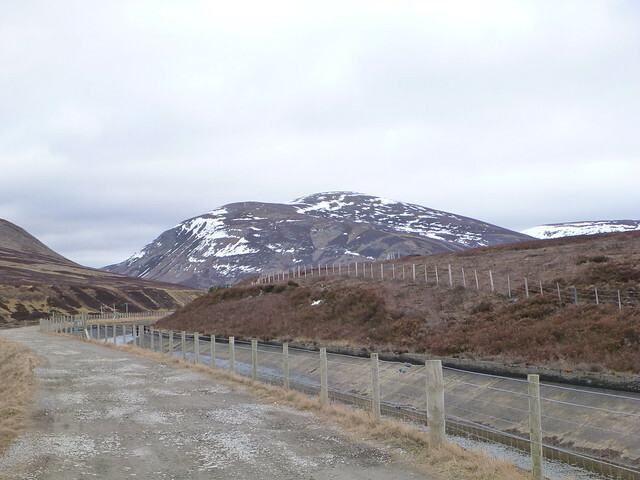 Have to say I felt a bit cheated on this one as I was barely aware of any incline at all from the bealach up from AM. Or maybe my brain had just been frozen. Got to the cairn with the assorted fence posts and tried a muted "50" celebration but not much cop when there wasn't even the dog there to share in the excitement. 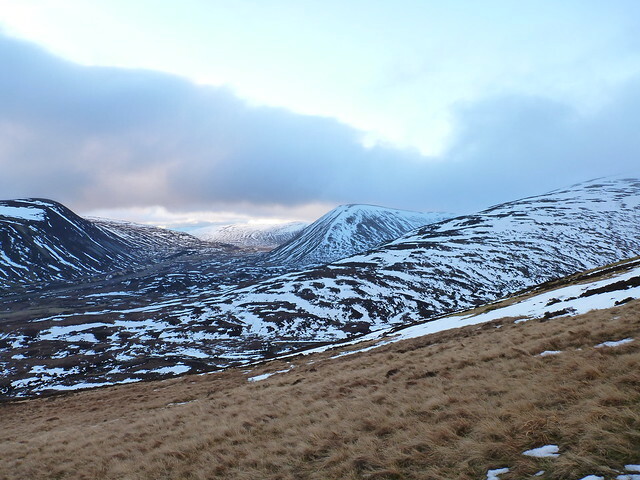 Quick coffee and flapjack before pressing on to the last of these 4, the delights of Sgairneach Mhor, the "Big Scree" - all of which was covered in a layer of snow, so was a bit of a misnomer today. Clag was still all encompassing at the top but started to clear whan I was descending. Anyway, back at the car in just under 6 hours from setting out, a quick bite of sandwich and rejoicing at the fact that phone signal strength is excellent, so able to log into WH and check out the other hills. 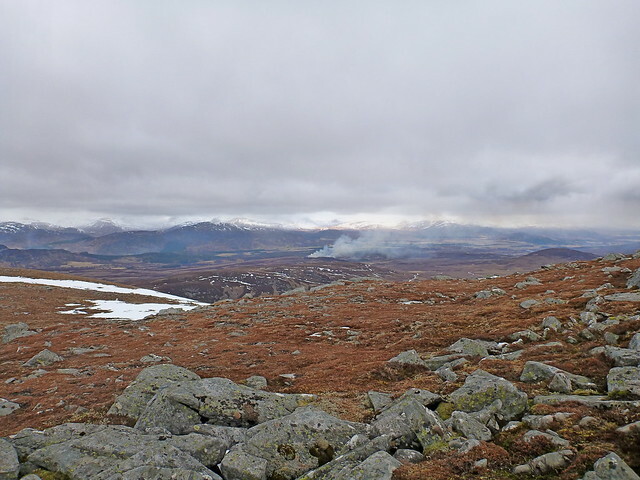 I spotted Meall Chuaich, which I remembered Cameron McNish saying was fine for an afternoon stroll - 14.5km - easy! 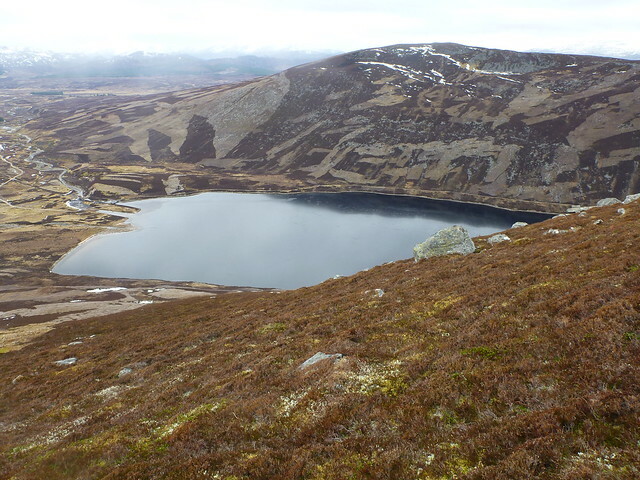 (I didn't spot Carn a Cairn & A'Bhuidheanach Bheag which would have given me 2 more hills instead of 1 for less KMs and I could have set out from where I was parked - oh well! ) Nipped into the car for the 4 miles or so to Layby 94, set the GPS to go and off I trotted. The first few kms are along the Hydro track, fine walking surface but don't gain any elevation meaning that when you come to the hill itself the 600-odd metres up are to be taken more or less at once. 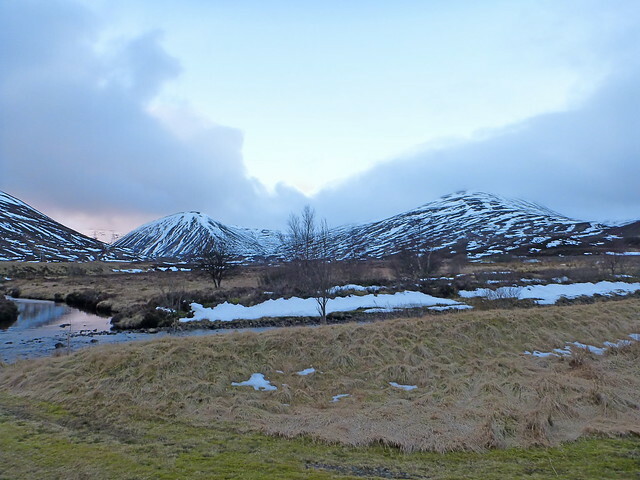 I could see the hill sitting in front of me, with Loch Chuaich hidden behind a hydro dam to its left. The hill was marked out in 2 tone Spitfire camoflage markings by the contrast between the heather and the grass and looked straightforward enough. Passed a few people who'd were coming back from conquering the brute. 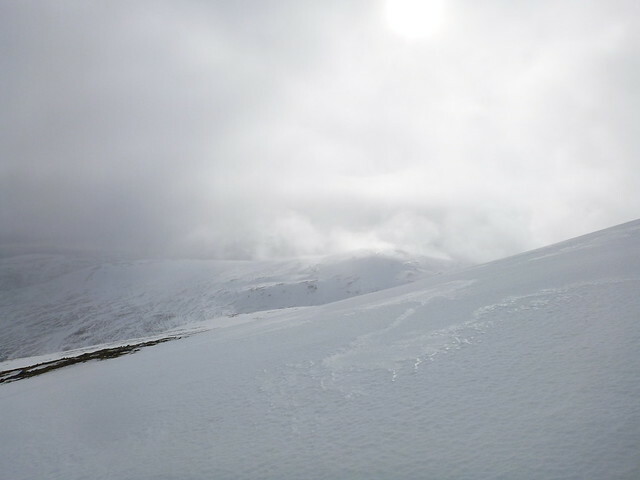 All remarked how cold it was at the top - I was in my baselayer only on the way up as it was toasty. 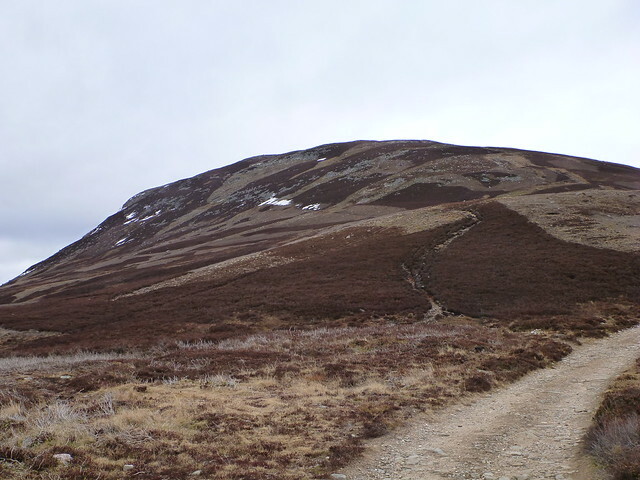 Once you leave the track it is steep enough to know that you are going upwards, over some bogs and heather and following an eroded path until the final section is reached at about 750m when the terrain becomes more rocky with patches of snow still lingering. More snow bunnies were gadding about. 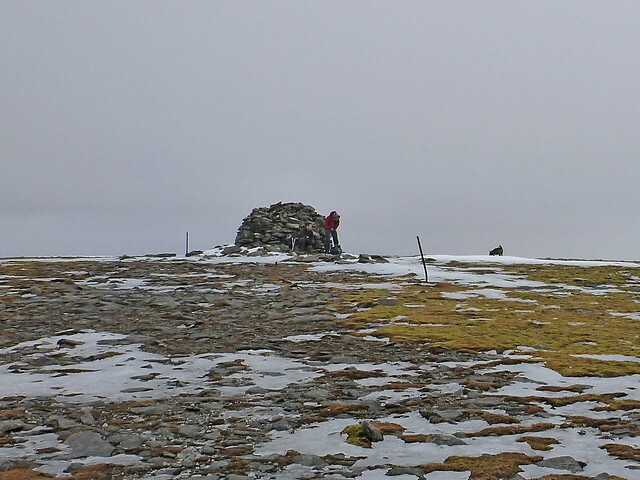 The cairn is a massive thing, like a castle for dwarves, and met a couple with their dog (was the dog's first Munro). Had hoped for some views, but it was not to be, and there was even some raindrops - my God had forgotten about Rain after all this good weather! Made good time heading down the hill, having a wee glissade at one point, although in some parts it was steep enough to hurt the knees a little. 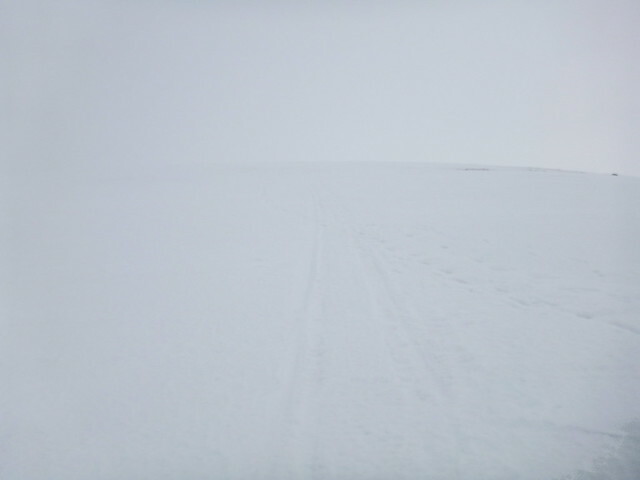 Back on the firm terrain of the track, feet still rejoicing about not being forced into winter boots for any more than an hour today, I was back at the car within 3 hours. Was great to be able to get down most of the road to Glasgow in the light rather than dithering about in the dark and dazzle of lights. Re: Drumochter 5 - 0 !! Big day out! I did these 2 trips seperatly - far too lazy to go out again upon reaching the car! I'm glad we had 2 cars and got to avoid the dreaded roadside walk. Congrats on the 50 and good to meet you yesterday. Unfortunately my legs were too sore to be a good boy and head under the tracks so hopped across them . Pity about the views yesterday though but that's just my luck! xpfloyd wrote: Congrats on the 50 and good to meet you yesterday. 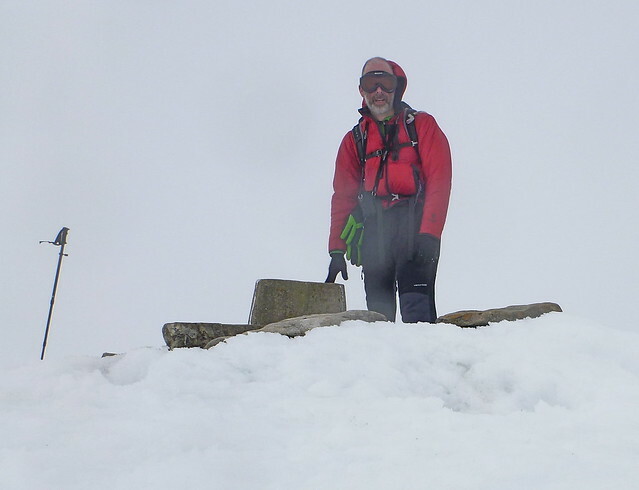 Excellent effort to add the 5th Munro. Looks like you were having a whale of a time. Nice photos. 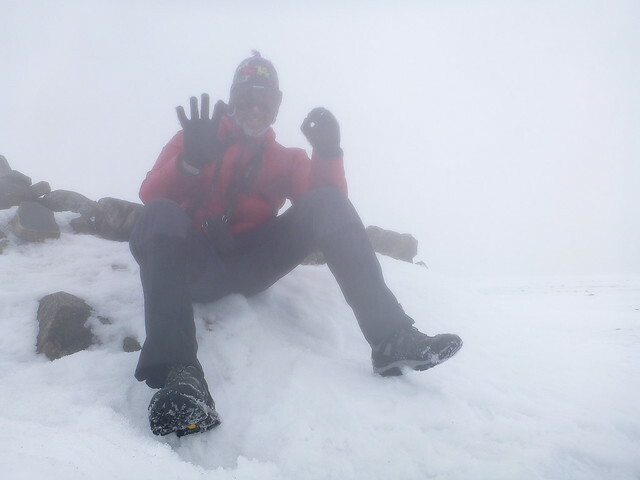 monty wrote: Excellent effort to add the 5th Munro. Looks like you were having a whale of a time. Nice photos. That's some effort doing the 5 in one day They were three trips for me, but enjoyed each one Pity about the lack of views for you though.